when it comes to co-op sessions with my bf, i tend to try fairly random games to see if any happen to pique his interest since the usual staples (e.g. mario kart, smash bros., etc.) are somewhat lost on him. most recently we tried out the arcade version of smash TV via the midway arcade treasures compilation on PS2 (also available on gamecube, and xbox). this review gives a good run-down of the SNES port, and i agree with his description that this game is a unique blend of run ‘n gun with shoot ’em up elements. basically you’re a guy with a gun moving from single-screen room to single-screen room, 2-D zelda style, shooting down waves upon waves of baddies. the 360-degree shooting action reminded me somewhat of the geometry wars games, although the over-the-top gladiatorial game show festivities of smash TV are far from the clean, cool aesthetics of those games. as an arcade classic smash TV was clearly designed to munch quarters: it starts off at a pace where a decent amount of skill will get you through unscathed, but by the time you get to the middle and late stages it’s clear you’d need a lot of practice to last even a minute. thankfully this release provides unlimited continues, so getting to the end is just a matter of patience. the power-ups are fun and somewhat reminiscent of the contra series, which preceded it by a few years. 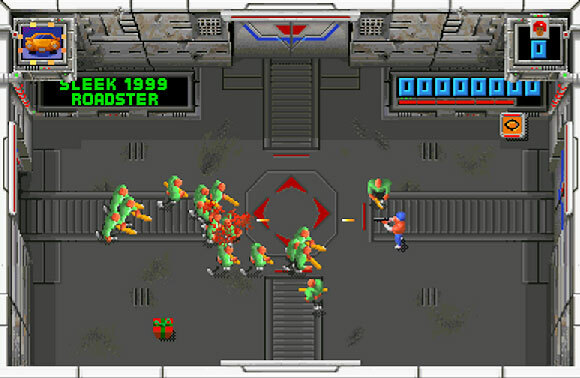 the contra series also includes co-op to double the fun, and both share a vaguely similar “rad” late 80’s vibe as well, and although the contra games also included top-down stages, smash TV‘s single-screen stages are way more fun. bosses are large and colorful and its humor is still effective 25 years later. a common point of discussion regarding the console versions is the various levels of awkwardness of the controls: in most cases you’re left having to use four buttons to replace the 8-way joystick for indicating your firing direction. in my casual run-through i didn’t find it to be a problem, but if you were trying to really refine your game an alternate scheme would be highly beneficial. there’s a maze aspect to finding the easiest path to get through each set of levels which would also make more of a difference on a coin-counting playthrough. it’s just as well that i never encountered this game in the arcade growing up since i would’ve wasted a lot of money on it. as it is, this was a nice short game, and i wouldn’t mind giving it another whirl at some point, although i’m leery of other versions such as the popular SNES version since they lack the unlimited continues of this port. – coincidentally, this was a together retro club pick right after resident evil, which i just posted about. reading about the club’s experience with the monthly picks is always entertaining. – there seems to be more info about the SNES version than the arcade version, and it looks like a very faithful port (which is somewhat surprising considering that enemies get mowed down in bursts of blood). here’s some footage and comments on that version of the game. apparently there’s also an NES version (among many others).